Using a combination of deadly glutaraldehyde fixation and cryogenic storage, researchers have demonstrated a way to preserve a brain’s connectome (the 150 trillion synaptic connections presumed to encode all of a person’s knowledge) for centuries-long storage. This laboratory demonstration clears the way to develop Aldehyde-Stabilized Cryopreservation into a ‘last resort’ medical option, one that would not prevent the patient’s biological death but would prevent the destruction of the patient’s unique connectome, offering at least some hope for future revival via mind uploading. The neuroscience and medical communities should begin an open debate regarding Aldehyde-Stabilized Cryopreservation's ability to preserve the information content of the brain. The Brain Preservation Foundation’s (BPF) Large Mammal Brain Preservation Prize has been won by the cryobiology research company 21st Century Medicine (21CM) and lead researcher Robert McIntyre (now co-founder of the startup Nectome). The Prize required the successful preservation of synaptic connectivity across an entire pig brain in a manner compatible with centuries-long storage. To accomplish this, McIntyre’s team scaled up the same procedure they used to previously preserve a rabbit brain, for which they won the BPF’s Small Mammal Prize in February 2016. This procedure, termed Aldehyde-Stabilized Cryopreservation (ASC), was published by McIntyre in 2015 and consists of perfusing the brain with glutaraldehyde and cryoprotectant prior to cryogenic storage. 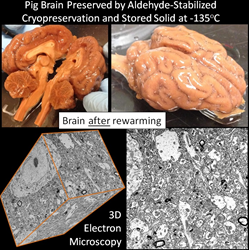 Extensive 3D electron microscopy was performed to verify the quality of connectome preservation following rewarming of the pig brain from cold storage. For this achievement the researchers will be awarded a prize purse of $80,000. It is important to understand that the researchers did not actually revive a pig or pig brain. The first step in the ASC procedure is to perfuse the brain’s vascular system with the deadly fixative glutaraldehyde, thereby instantly halting metabolic processes by covalently crosslinking the brain’s proteins in place. Glutaraldehyde is sometimes used as an embalming fluid, but is more commonly used by neuroscientists to prepare brain tissue for the highest resolution electron microscopic and immunofluorescent examination. It should be obvious that such irreversible crosslinking results in a very, very dead brain making future revival of biological function impossible. So, it is reasonable to ask: “What is the point of a procedure that can preserve the nanoscale structure of a person’s brain when biological revival is impossible?” The answer lies in the possibility of future non-biological revival. A growing number of scientists and technologists believe that future technology may be capable of scanning a preserved brain’s connectome and using it as the basis for constructing a whole brain emulation, thereby uploading that person’s mind into a computer controlling a robotic, virtual, or synthetic body. The Brain Preservation Prize challenged the scientific community to develop a ‘bridge’ to that future mind uploading technology. The similarity to cryonics is obvious, but in this case the possibility of biological revival was dismissed as currently not feasible. Focus was instead directed toward provably preserving the information content of the brain as encoded within the connectome. Quoting from a recent video presentation by BPF president Kenneth Hayworth: “Aldehyde-Stabilized Cryopreservation is cryonics for uploaders”.